Replacement: None. We are no longer carrying MakerBeam in our catalog. This page is for reference only. MakerBeam is a Mini-T open-source building system. Mini-T is a miniature version of T-slot (a technology that is widely used for industrial automation, robotics and machine enclosures.) Not only is it small enough to work as a model building system, but it's also precise and strong enough to build real machines and robots. 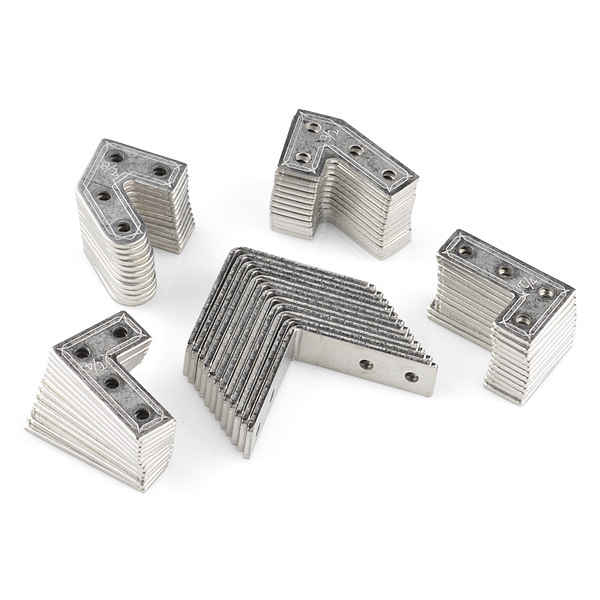 It consists of square 10mm extruded aluminum beams, various connectors and the hardware necessary to build just about anything. All you need is a dream and a 7/32" driver! This stuff is very cool, and there is absolutely no end to what can be done with it. Motor mounts can bolt directly to the beams and with the use of our small angle brackets, you can mount servos as well. Because MakerBeam is open-source, you're encouraged to develop and build your own pieces to interlink using the Mini-T standard, even further expanding the possibilities. Check below for the extrusion profile. Note: In case you have trouble distinguishing between bracket angles, each bracket is conveniently engraved with it's angular measurement (albeit in tau radians). 1) As a mechanical engineer, it brings a tear to my eye every time you guys add cool pieces of (non-electronic) hardware on here. 2) I'm sorry to all the Standard/English(Imperial) units folks out there, but metric is what everyone in academia uses and what every engineering student prefers to use because they are SO much easier to manipulate in equations. I never fully understood why, especially when in my physics courses, we (America) stick with standard/SAE measurements. Anyone have any understanding as to why? Is it just a matter of industry dread of conversion? I detest needing to buy two set's of tools and never being sure (mostly because I'm just a hobby type guy, not a professional) whether I should expect a bolt, screw, etc to be metric or standard. I really do wish we'd just adopt metric and be done with it. Expecting the world to adopt Standard/SAE measurements makes no sense to me as it's an inferior system, best I can tell. Come on :-) Nobody uses slugs unless you have ancient books. The foot-pound-second system uses pounds mass for mass and poundal for force. Be glad you are not using dynes as was popular when I first entered physics (dyne-cm-sec system, a variation of the French metric). Fortunately no one in academia builds bridges, or much of anything. We could get a Stonehenge replica 20 centimeters high (shameless Spinal Tap ripoff). He probably should have said "but metric is what the whole rest of the world uses". I still can't fathom how people can stand to use imperial in engineering, with all its weird constants and conversions and base-12 etc. Haha, oh open source. Only you would do something helpful like engrave the angle in each bracket, but render it useless by using some obscure unit like tau radians instead of degrees. Tau radians are really easy, 1/2 Tau is 1/2 the way around the circle, or 180 degrees, 1/4 Tau is 1/4 the way around the circle, or 90 degrees, and so on and so forth. Edit: looking at the pictures, they seem to have mixed up tau and pi, they used the tau symbol, but the divisor from pi. That will have to be fixed. The point is not that it is hard to figure out, which it is not. Rather, it's that they've chosen to use an esoteric, and inappropriate method of labeling angles. When it comes to measurements for these types of systems, people don't want to figure out fractions of tau or pi. We use degrees so we don't need to constantly adjust for changing denominators whenever we apply arithmetic operations to the angles. It's the same reason why we don't measure distances in fractions of units. All this shows is that the Makerbeam folk are out-of-touch with reality and practicality. Unfortunately, this seems to be a pattern in many open source projects, which is why they're often not taken seriously. Look, Tau and Pi are like US and Metric measurements. The US system is what we're used to, but in geometry, it's much easier to think "OK. Half of Tau is a half circle. 1/4 Tau is a quarter circle." because EVERYONE knows 1/2 a circle is 180 Degrees!!! I love to recite Ï to what, 80 decimal places, but try thinking "OK. (1/2)Ïr is 90 degrees. Ïr is 180 deg. 2Ïr is 360 deg." And with Degrees, well, that's just what you're in love with. And when you're rotating from 5/8 tau by 1/47th tau? What then? Bring out the calculator and find the common denominator? Or what, revert to decimal places of tau? What have you really gained? This has nothing to do with being "used" to a certain standard, because the tau-radian system is just as impractical to use for such applications as the pi-radian system it mimics and seeks to replace. Do you ever see pi-radian measurements on tools and structures? No? Why is that? Because it's a fractional angle system that's a pain to use. So why burden people with another fractional system? The counter-claim is that Imperial measurement systems often specify lengths in fractions (e.g. 5/8th inch) and it works and is accepted. That's true, but these simple-fractions act more as a label for a standard size than as something to be used in an arithmetic system. If using only simple-fractions is the intended use of tau-radians, again, what have you really gained? The degrees system was introduced and continues to be used thousands of years later because it has many integral factors for useful angles. Furthermore, as a non-fractional system, simple arithmetic operations are easy to perform using it. Two angles to add? Just add the degrees. It combines the benefits of a fractional system for exact angles with many integral factors, and a decimal system for simplicity of arithmetic. The tau-radian system has some benefits over pi-radians, but is simply impractical for general use compared to the degrees standard. Oh, by the way, Mr. Obnoxious, the angles of the brackets are permanent angles. You're not going to be changing the angles of them by rotating them by 1/58 Tau. I have better stuff to do, and so do you. Get a life. EDIT: Sorry, "Get a life" was a bit strong. I was quite a hothead at that particular moment. This thread is likely dead, so I don't feel too bad thinking aloud. Tau can be argued for, as a matter of principle, logic and esthetics. But similar arguments can be made for us all speaking Esperanto. No one outside the deepest bowels of academia learns a language for which there are neither a)interesting people with interesting culture to talk to or b) a language that has no historical record worth decoding. Tau made for an interesting essay. Tau seems like something that I can imagine a physicist adopting to not clutter equations. Sorta like setting the speed of light to 1. It makes calculations easy, but then, you still end up thinking, "Wait, so what would the speedometer read, in MPH, not fractions of the speed of light." It's not much of an advantage. The counter argument, however, might be pretty compelling if you really believed tau was the 'right' unit, and that the cause would be best served by introducing it to others: they mark the bar in units of tau to encourage you to use it. It is alien, and offers no immediate benefit, but what benefit there is might only be obvious after thinking with tau for a while. You can, in fact, ignore the markings, or count them as a fractional angle. The tau evangelists might piss some people off. The market could punish them. It's all part of the process of vetting an idea. So I understand how you feel, I think, and still try to see where the tau-ists are coming from. Esperanto is a very interesting monument. I think we are better off for having it happen, and having it flop was a success in the market of ideas. Tau will sink or swim just the same. LETS MAKE OUR OWN SFE STANDARD MEASUREMENTS!!! we can measure length in Daves and time in Roberts!! And the equivalent of current is measured in Petes!!! I quit this NetArg. We're clogging up the comments. "It's the same reason why we don't measure distances in fractions of units." Who said it was "inappropriate"? You? How do we know that you're not just a stupid person? Oh, man. I keep forgetting even though I'm 6th grade age, I'm in 5th because of my birth date. The manifesto confused me...I'm probably a simpleton but isn't the point of PI to find the circumference of a circle when you only know the diameter and then build arc lengths from that? I guess TAU could be just called circumference? The example under figure 8 shows him giving an arbitrary length then dividing by 12 which doesn't really need explaining. If you already know the circumference you wouldn't need PI. Also, PI isn't a measure of an angle it is a ratio of the diameter to the angle. So if you had a circle 2 whatevers across the circumference would be 2 PI R.
It just seems like a TAU is a redundant name for something else. Check out Pi is (still) wrong by Vi Hart. It's pretty interesting and makes a good argument for Tau over Pi. And she uses pie to explain some of it too ("I'm pie-winning")! doh!, not sure how I messed that up. People are not going to use Tau (sometimes referenced as a turn) unless people start using Tau :D Same deal with metric, if you keep using standard measurements, people will keep using them and we will not get anywhere. I've been using Tau in engineering for a couple of months now, and typically when people don't understand I just tell them that Tau is the circumference of a unit circle and they get it. Tau may be obscure, but that is only because everyone has been mis-taught to use pi; similarly the stupid continued use of standard measurements in the US. You know, even in metric countries (I grew up in one), people still use celsius for temperature and degrees for angles. Even though scientifically, it makes more sense to express temperatures in Kelvin and angles in Radians. I'll start using the French Metric (all systems of measure are metrics) when they apply some human factors to the unit names. The Greek and Latin prefixes are too clever by half and served to set academics apart from commoners. The English or US systems use one syllable words that can not be confused with each other. No one confuses inch for yard in a noisy shop. Try millimeter, centimeter, decimeter, kilometer in a noisy environment. Cup pint quart, deciliter, liter, oops, it jumps by tens. Ever notice your scope scales by 2 5 10? Powers of 10 are too big a jump. 12 is commensurate with 2, 3, 4, and 6 and is much more useful. 10 is commensurate with 2 and 5. 1/2, 1/4, etc are related geometricaly to folding, just like powers of 2. How do you get 1/10? Ever notice your scope scales by 2 5 10? Actually, these numbers are still powers of 10, just fractional. 10^(1/3) ~ 2; 10^(2/3) ~ 5; 10^(3/3) = 10. It'd be just as likely to happen as if I told one of the electricians at work that the overhead busbars are 330kv and he hears 330v and then tries to fault find with his Cat 3 600v multimeter. There is only one Metric system, so there is no need to bring politics and nationalism into it by calling it 'French'. US system, not so much: ? = 3 leagues = 1 mi = 5280 ft = 63360 in = ? Further more, you have oddities within the system, for example the volume between and liquid and dry gallon are different, or the difference between survey and nautical miles. Lastly, base-10 is used because we think in base-10, not base-12. And the difficulty in using fractional numbers is really superficial. The Us system fails here because there is no agreement between mass and distance units. Come on man, that is a poor argument. Its more likely you'd mis-hear the value than the units. Get some post it notes and a pen next time. It should be obvious why powers of 10 on scope scaling is not used, it is a visual instrument. Thankfully the units themselves (volts) are metric. This tau radians business seriously irritates me. tau isn't used by mathematicians, they have better things to do than to define new notation. Engineers certainly don't use anything besides degrees. There's not an instrument in my toolbox that measures stuff in tau radians (except a tape measure bent in a circle. It's inconvenient for mathematical expressions, since tau is already being used for proper time, time constants, torque, lifetimes, integration dummy variables, shear stress, etc... many of which show up with factors of Pi. Nobody uses tau, nobody will use tau, the whole thing just distances the engineering and scientific community from the coffee swilling ipad toting arduino lovin maker community. I completely understand the idea, the concept, how intuitive it is, but give it a rest. There are more important things to do... like not spending additional money to mark somewhat obvious markings + decoration on the size of brackets that come in 45 degree increments. "the whole thing just distances the engineering and scientific community from the coffee swilling ipad toting arduino lovin maker community"
LOL, I couldn't agree more. I thought that might be the origin of the term, but what can you expect from people who control their micros with "sketches"? It's a fad, it will pass. When these people need to get something made in the real world they'll discover that degrees and programs aren't really scary after all. Radians aren't obscure at all. /4 is 90 degrees (4 sided object) /6 is 60 degrees: makes a hexagon. There is a method to the madness. 99.99999999% of folks have no idea what tau radians are though.... They would have done themselves better inscribing 60 degrees or pi/3 instead. Or you could just look at them and say "this looks like 90 degrees" and "this looks like 60 degrees". There's only a few choices in this kit, not hard to tell the difference. Oh I don't disagree. But the point is, they decided to engrave them, most likely to be helpful. But then they were so nerdy in doing it that for most people, they negated any helpfulness they may have been able to provide. But then what is the point of labeling them at all? Dude, you can't drop the "tau"! Those aren't radians. A radian is the angle of a circular arc with length equal to the radius of the arc. And tau/6 makes a three sided figure, not six sided. A hexagon is made with tau/3 joints. It's just like the ordering of the C-series of two dimensional symmetry groups. That's what makes it so simple - it focuses entirely on the planar entity at the joint and simplifies out both the figure (the space enclosed) and the dimensions higher than that of the joint (ie, the third and fourth). Hi, I was just wondering if anyone has had any issues bolting down the beams due to the fittings slipping in the T-slot? I'm used to working with regular aluminum X-beam where the nut runs inside the channel and are wide enough in one direction to prevent rotating. I purchased this set a while back and had the same thought -- what prevents the bolt from turning? After working with it, I've found that it's not an issue. Friction appears to be enough to keep the bolt from turning. This stuff is pretty small, so it's difficult to see if there's anything on the inside of the track that increases grip; I certainly can't see anything. 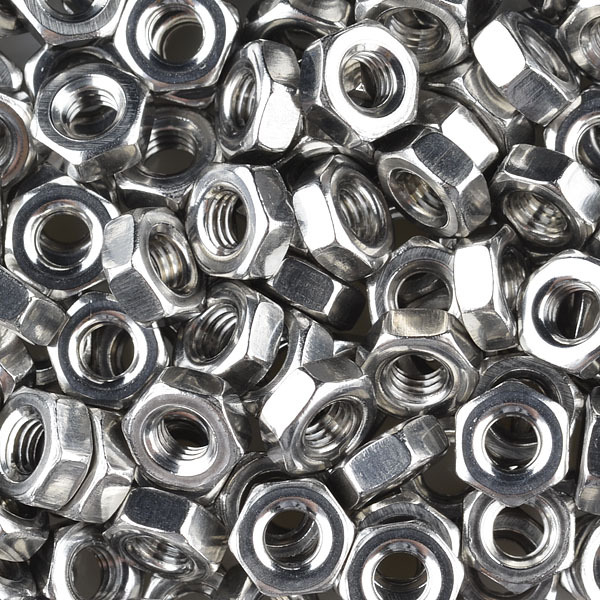 The nuts tighten down quickly and easily as if the bolts were square heads. I'm using a frame I built out of the MakerBeam to hang a 5 lb spotlight from a doorframe. Two of the beams are oriented vertically and secured to horizontal beams at both the top and the bottom with angle brackets from this set. As you can see in the pictures, there are four bolts per bracket (two for each plane). I'm using all four and tugging on it as hard as I can, I can't get it to slip. I'm not worried about the light falling at all -- I bet it would hold a good deal more weight. One thing that puzzles me. What keeps the bolts from turning when you are tightening the nuts? I don't see anything on the bolts to stop rotation. I'd expect a square section at the base of the threads, like on a carriage bolt. What am I missing? 10 seconds work with a file or grinder would solve that problem. Just make the bottom of the head of the screw narrow enough to grip the slot. You wouldn't really care about using the head for anything other than ensuring the screw doesn't pull through the slot and you wouldn't have to remove much material to make it work. Good point, just friction then. Push or tilt the bolt to increase. I tried to find dimensions for DIN603 M3 carriage bolt, couldn't find any specifics but it doesn't seem like it would work. Could also use a T bolt which would have a rectangular head. Presumably it was a cost/availability decision to use the simpler style bolt. "All you need is a 7/32" driver" will you be selling these any time soon? Sparkfun should offer a few options to buy Makerbeam of various lengths. I found out that I go through a lot of the 10, 15, 20 and 30 mm in framing the project and have little use for the 4 and 6 cm beams. Also, the option to buy more 90 degree brackets and nuts & bolts would be helpful, too. Are you guys really this upset because you need a 7/32 driver? Looks like some pretty cool rack gear. I am an engineer and am fully capable of multiplying and dividing by 25.4 or multiplying by it. Whatever it takes just make it work! As nice as one unit system rather than 2 would be that is not the world we are living in at the moment. Go back to making cool stuff! I thought the argument was over tau radian angles! could you make a frame for a small quadrotor out of this? I don't know either, SFE decides to market and sell whatever they want to.....other than that, I don't know why anyone really cares! Deal with it people! I may not need to use tau radians or any other complex measurement in my high school (junior year) career, but I might run into them. And if anyone can't tell if something is a right angle or not, just grab ye 'old handy protractor and start measuring! Thank you for making available MakerBeam in North America for a relatively affordable price. It would be useful if SparkFun sold the longer M3 T-bolts and cap nuts. 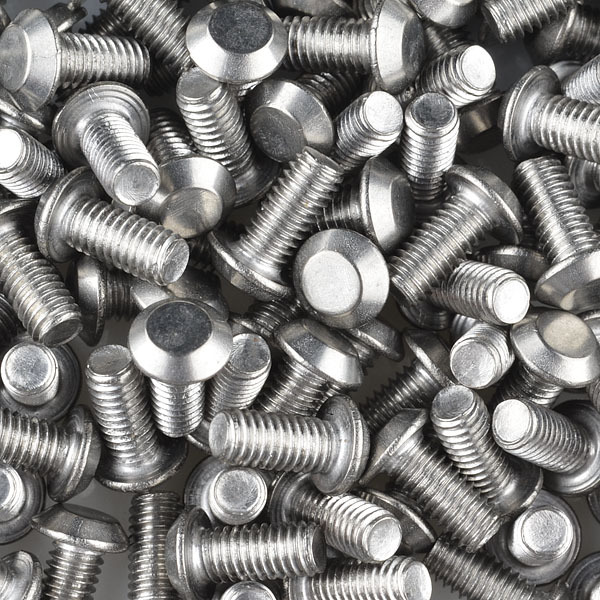 MakerBeam now sells 12 mm studs, but their website suggests that shipping alone from the European Union to the United States will exceed EUR 17.50 (USD 23), which makes that a mighty expensive little bag of screws for those of us not importing large quantities. Hopefully, SparkFun can help build market demand for these mechanical prototyping kits so that the economics will improve for everyone. I welcome SparkFun's growing selection of mechanical parts and actuators! Edit: I would also welcome a clear anodized version of MakerBeam, if it doesn't drive the price up too much. Anodization at home is possible, but it involves hazardous materials; and I've not figured out the proper safety and environmental protocols. So a commercially-finished product is desirable, if you can offer it. After working a while with both Makerbeam and Microrax, I can say that I definitely prefer working with Makerbeam's product with the following proviso: as Frank G. Haymes discovered above, it's quite necessary to use lock washers to bind the bolt as well as to effectively shorten the remainder of the bolt which extends past a tightened nut, thus protecting it from accidental damage which would prevent the removal of the nut in the future. Makerbeam's extrusions feel better to my hand than does Microrax's product. It may seem to be a rather hedonistic statement at first, but believe me, after spending a couple of hours of assembling (and disassembling/reassembling due to a forgotten design element), my hands were pretty banged up after completing a Microrax design. On the other hand, Makerbeam's product, featuring a much larger contact surface area, was much less prone to causing hand fatigue, pain, and irritation. Believe me, when you've spent the last three hours wrestling with a design prototype, you'll appreciate Makerbeam's product. I know some of the MicroRAX guys personally, and we'll be collaborating on future accessories to make sure they will be compatible across the systems. I designed OpenBeam to address the design flaws in MakerBeam with the fasteners. I Just received my Makerbeam kit. I have a problem with the bolts. There is no way to tighten up the nut and bolt. The bolt should be some type of T-head so they will not rotate when you are trying to tighten them. I can not recomend the Makerbeam kit until the bolts are fix. I have figured out how to get the nut and bolt to work. By putting a lock washer under the nut, the bolt is held in a bind. You now can tighten the nut. The lock washers should be included in the kit. I don't get it. you guys act like this is the first playset of extruded aluminum t-slot or something. Xbeams tried and died even when Trossen took over. If you get this hobby kit, you are stuck with a .394 profile and a limited # of connectivity options,.. whereas if you start with 80/20, you have a massive amount of real-world parts available. Don't get burned like the xbeam robot people did. get a system of parts where the options are as wide as your imagination, not just some guys on kickstarter who wanna re-make an old toy. Glad to have funded this when it was a Kickstarter project and am thankful that Sparkfun is a distributor. Small-scale extruded struts is wonderful. Is this still being made? The Makerbeam website is "coming soon" for three years or so, and the kits is nowhere in stock. Has anybody actually bought one recently? We SHOULD see them back in stock in a week or so. Â¿could you give an estimation of when this product will be available again? Ever coming back? 1 month still out of stock?!? It's coming back. I think they underestimated how popular they would be. We have them on order. We've ordered as many as maker beam can supply. "All you need is a dream and a 7/32" driver!"... and $130. Also can anyone tell me why it costs $129.95? It costs 129.95 because the setup cost is high and SparkFun needs to make a profit. If you check out MicroRAX the price for a kit the same size isn't much cheaper. Hopefully SparkFun will offer individual lengths and hardware packages as MakerBeam increases production the same way MicroRAX does. MicroRAX needs to acknowledge the fact that there product is makerbeam .. Which is an opensource hardware design funded through kickstarter. Really tics me off that they so obviously stole the design and did not even mention the source. They actually ordered their first extrusion run before Makerbeam put up their kickstarter campaign. This is definately cool stuff. 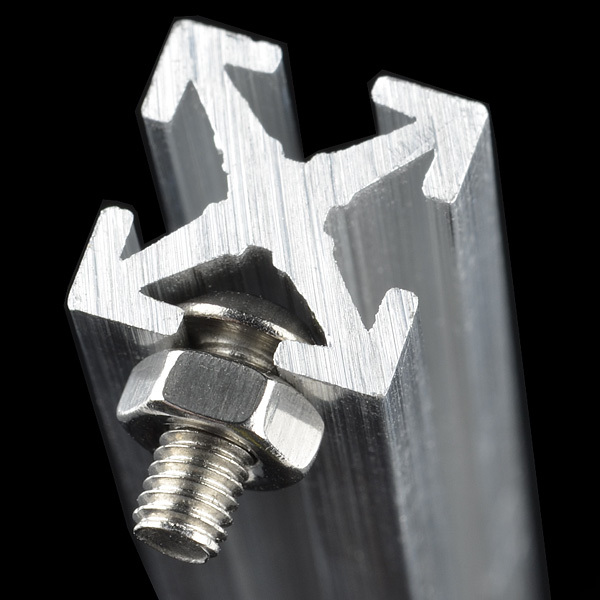 I have seen how much we use extruded t-slot at work and its a huge benefit over some of the welded frames we use. In any case I have been extensivly looking over both MakerBeam and MicroRAX and comparing what I like and what I dislike. So here is my take on these two. I very much like the design and the flat edges it has. It is visually appealing and a well thought out simple design. I especially see why SparkFun picked MakerBeam over MicroRAX - PCB slot. The one thing turning me away from MicroRAX is that it doesn't have the PCB slot. Arguable it probably wasn't even considered for them but it make sence MakerBeam found a home here. The captive screws are really hurting this for me. It may not be as big of an issue for others but that is really the only part of this I dislike. I would rather not having screw threads exposed everywhere. It is a disaster waiting to happen if you drop your project and gall the crap out of the threads and now you can't remove the nut. No PCB slot. I really want to use some of this stuff to make sweet enclosures and the PCB slot could double as a plexyglass/Lexan slot. I would have to fab up a few inserts to hold it in there or have the cover over the beam and its just not fair to cover up how cool the t-slot looks. Both products have their place. MakerBeam fits here at SparkFun and MicroRax is a great DIY tool as well. Who knows MakerBeam is still young and we may see improvements in the future. I'm new at micro electronics, but the PCB slot feature doesn't seem useful except maybe for complete home brew creations; even then isn't the slot double the width of a standard PCB? The stuff we buy either has mounting holes, or small footprints with electronics at or hanging over the edge. I don't see how t-slot beams will work to create frames around boards; below boards, fine, but that isn't a unique feature. I plan to experiment with it as a frame around sheets of lexan. It depends on what slot you are talking about. The entire opening is .118in (3mm) wide which is about 2x the thickness of my Sparkfun LCD Shield PCB which is .062in. I was more talking about the .039in (1mm) and .078in (2mm) measurements. If you watch the product post where MakerBeam made its debut Rob showed a small prototyping station with panel mounted buttons. Also recently the product post featuring the 2 axis claw add on a panel of buttons was made with MakerBeam. I assume if its working for Sparkfun it should be just fine for the rest of us. You are right with using it as a boarder for already made boards it probably would not be very good. But even then I don't think my Arduno Uno can handle the nuts being on the outside, there just is not enough space to get the nut and a socket in there. It would be a pretty awesome add on for Erector Sets but I have a feeling the screw size is not compatible. The comments here about "tau radians" truly surprises me. I would assume that most people who shop at Spark Fun are playing around with electrical and electronic gizmos such as servos, stepper motors, micro controllers and the like. In trying to understand the accurate programming of stepper motors I was somewhat baffled until I dragged out an old trig text and reworked several of the sections on angle measurement in radians. Of course the text was written around pi radians, but when I saw the discussion of tau radians here, I did a little research and now I find that the calculations and the programming are both easier if I substitute tau for 2pi. I guess the surprise is that people who are involved in the cutting edges of technology would suddenly turn into intellectual mossbacks just because they run across a new viewpoint toward an ancient mathematical fundamental. Does anyone have suggestions on companies where I could get some custom aluminum pieces made, for a fair price? I'm a machinist. Maybe I can help. Shoot me an email of what you're looking for, compuslave at gee male dot com. One small difference between MakerBeam and MicroRAX is that with MicroRAX the screw head is outward, giving the assembled pieces a more finished look. With MakerBeam, the ends of the screws are outward and thus creating pieces with sharp spikes; which would tend to scratch walls, catch wires, etc. It's a small difference, I know, but one that a buyer should be made aware of. Also, 80/20 does make 1" x 1" beams ( 25.4 mm x 25.4 mm) in an "ultra lite" version that appears pretty useful for robots mid-size and up. I've never done it, but you should be able to mix microrax and makerbeam. The brackets aren't that different. You should be able to use makerbeam beams with microrax brackets. If the spacing between holes is the same, you should be able to go the other way as well. I think interoperability between building systems, just as it is between software, is THE single most important issue. I'm not saying everyone has to use the same system, but the different systems should at least provide easy ways to combine systems. Otherwise there are few benefits to "open" systems. Please find a source of linear bearings for this stuff. The same kind they have for 80/20. I would appreciate it because I could just order the damn stuff and sleep again. I cannot make heads or tails of what system the extrusion profile is measured in (want to know the exact measurements to figure out if I should buy them). Can someone please help me? It's measured in decimal inches, but translates to whole metric millimeters. You guys should stock a 5.5mm nutdriver for these nuts-- local hardware stores in the US don't always carry them (although I did find a 5.5mm socket at Sears). Also, I'd like to be able to get longer lengths, in single piece quantities. BTW this stuff isn't meant to be a substitute for 80/20-- it's much smaller than anything 80/20 makes. Whether it's better than Microrax or not depends on what you're doing with it. Maybe the labeling in tau radians is an effort to educate the layman rather then help the expert. You'll be educating the experts because nobody uses it. So it is more to carry out an agenda, than serve a useful purpose? When the subject of the agenda isn't useful. Dude, 1/3 of SFE's GOAL is to educate the masses. Well before today I had no clue what a tau radian is. So if the agenda is to teach the masses rather than label the obvious, then yes, yes it is. Sweet! That's exactly what I need. You better not run out of them before my order comes up in the queue. Put some aside for me! My only concern was the metric-ness of them. I like my 4-40 screws just fine, thank you very much. And I refuse to pronounce Aluminum "Aluminy-um" Say it with me! "ALUMINUM". Pronouncing it "Aluminy-um" sounds like a speech impediment. Ok. I feel better. I just had to vent. "Tau Radians", huh? What do you have against degrees? Good 'ol base 60! Can't get more old school than that. It was good enough for the Sumerians 7000 years ago, still works today. It's hard to fight that kind of continuous use of a numbering system. 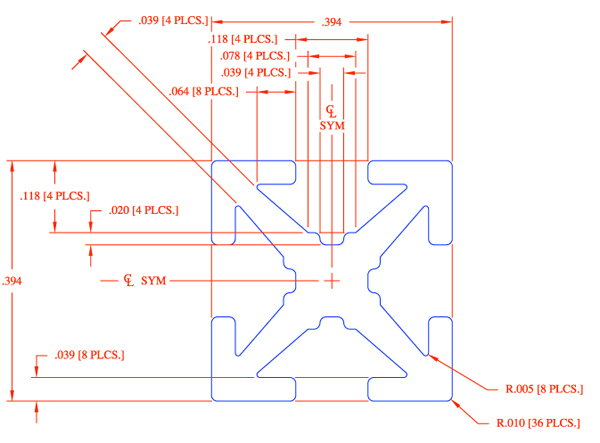 Project idea: Propeller clock with a Tau Radians face. Just to really mess with people. That's because you speel Aluminium wrong. Hmmm... Tau noon. I like it. It could even be a movie title. See also microrax.com for a similar product and for some good product ideas. Yeah, it's a very similar setup. One thing I really like about their setup is the addition of captive nuts and screws as opposed to captive screws and nuts like this one. What I don't like is the single .9 meter length. Too inconvenient. Nate: Add a captive nuts and screws package for the MakerBeam. And just drop ship me a couple of them when you do. Any idea if there's a source for more joint options, e.g. gussets and plates? What is your source for this product? Is it a sparkfun mini-t product or something else? When can we buy the extrusions individually? I've been waiting for someone to carry a mini-t product since the original kickstarter. Can sparkfun provide some details to the mysteries surrounding the progress of the mini-t makerbeam concept. The information is spotty and makerbeam.com is no help. Check out the 80/20 store on Amazon. Prices are really reasonable, but I don't believe they have pieces this small. The question is where are these extrusions coming from? 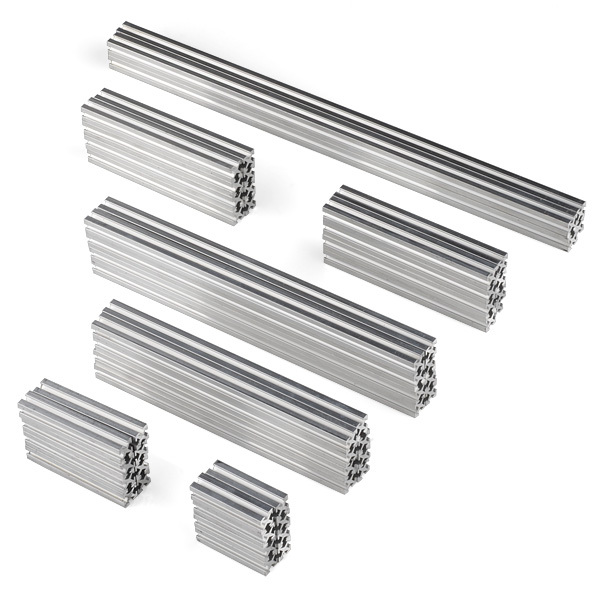 I would be surprised if sparkfun actually invested in a production run of mini-t standard extruded aluminum. Does Makerbeam exist as a company? I'm fairly certain that Makerbeam does exist as a company, but they just don't have the website up yet. Check out the updates section of the kickstarter page, they have pictures of the alpha and beta parts there. Thanks Jamo, i missed the updates section of the Kickstarter page. cant wait to see whats next. It's basically VERY handy too. The New Product Post in which these were introduced had a little dev platform, a Rover 5 cage, and rubber band guns/clubs. All built from ONE kit! I'm terrible with physical measurements. Is one kit enough to build a decent CNC frame? It would be really cool if you would take one kit and build something for the product photos. That would clearly give an idea of what can be done. You can buy the plans for building a CNC out of 80/20 at 80/20 CNC. I believe he charges $19 for the plans, which are worth it. Ok, thanks for your help (both of you). I will likely end up using someone else's plans yes, as I truly am horrible with getting physical measurements right. I may go with 80/20. I have heard several people talk of building theirs with PVC (plumbing tubes) but I would feel nervous being that cheap. Don't have the money now, but I have been longing for this stuff since before it even existed as a kickstarter project. I searched everywhere for small scale t-slot extrusions for a robotics project in college, now its here. Hell yes indeed, this stuff rocks.